← Revisiting My Teenage Geeky Figure Skating Lovin’ Self #1: Why Do All My Faves Retire Due to Hip Injuries? That Sunday, Edwards was befallen by a late hit by Adrian Wilson (because the Cardinals hate any quarterback I remotely like), was concussed, and my plan to buy the Edwards shirt went out my apartment window. Why? The whole purchase of a player jersey is such an iffy investment. They might suffer a nasty concussion or ACL tear that knocks them out for the rest of the season. In some instances, that player may never be the same after that injury. What if they just play poorly, continue on a downward spiral, and end up being replaced? Unless they have two or three solid seasons to their credit before that happens, if you buy their jersey, it looks like you make rash judgments and spend frivolously. With Edwards concussion, I was jolted back to reality. This kid hasn’t played an entire 16 game NFL regular season yet in his career. He’s only in his second year in the NFL. He’s been befallen by knee injuries in both college and pro ball, he’s now had a concussion…there is just too much at risk. Even after today’s win against the Chargers, I’ll reevaluate where Edwards is at Week 10 and see if he’s still the quarterback of the Bills future he looks like he is. 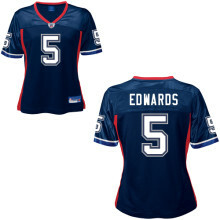 If he is, maybe I’ll purchase the Edwards t-shirt. Or maybe I’ll wait. Buying a jersey is a serious commitment, and a serious outlay of cash – you really have to be committed to the athlete to take that step. The other jersey question that has been brought up in the past few weeks is the question of jerseys of college athletes. My beloved NCAA regulations specify that the selling of jerseys or t-shirts with student-athlete’s names on them for profit is prohibited. For example, when Boston College quarterback Matt Ryan was in contention for the Heisman Trophy last year, you would find t-shirts for sale that read, “Heisman Trophy Candidate, #11” with the Eagles logo on it. Ryan’s name did not appear anywhere on the shirt. However, some jersey customizations fall through the cracks. 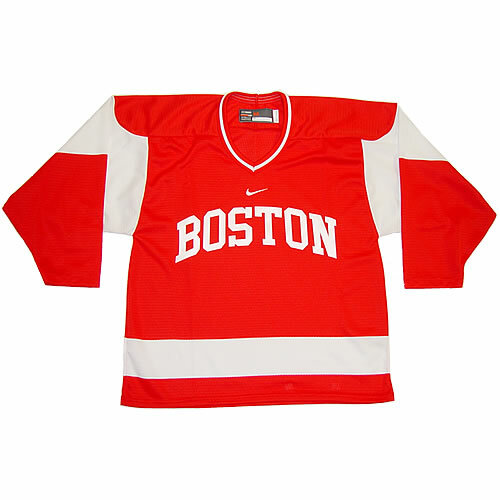 Despite the “forbidden customizations” list many licensed retailers have, at Boston University hockey games, you will see a smattering of customized jerseys. Someone two rows back from me sports a Gilroy #97 jersey, a pre-teen girl the section over sports a jersey of the Forward Who Shall Not Be Named (FWSNBN), and a colleague of mine owns a MacArthur #16 jersey. There’s more than just those three, but those are the three that are always there. The University can’t mass produce these jerseys and sell them, but these fans somehow custom ordered these jerseys to reflect their favorite players.